The building itself, with its scalloped windows and balconies overlooking courtyards, is lovely to see. In the evening, the courtyard at the entrance hosts the Dharohar cultural show, a one-hour celebration of the music, dance, and puppets of Rajastan. During the day, you pass a room dedicated to these gorgeously creepy puppets before entering the main house where displays of the royal lifestyle are found. One of the more interesting exhibits showed the indoor games that women of the Royal household played to while away their leisure hours. Peeking in through a glass window, you learn that they liked to play Chess, Chaupad, and Snakes and Ladders while seated at jewel-hued silk cushion. Something to think about for Family Game Night. The humongous turban was…puzzling. Without an explanatory plaque, we were left to guess that it was a display piece meant to be part of a collection of turbans, possibly owned by the Mewari royal family. I’m 95% certain that the giant turban is too big to have ever been worn. What my kids liked best was that a basket of turbans were provided so that they could pose for genie photos in front of the BIG one. 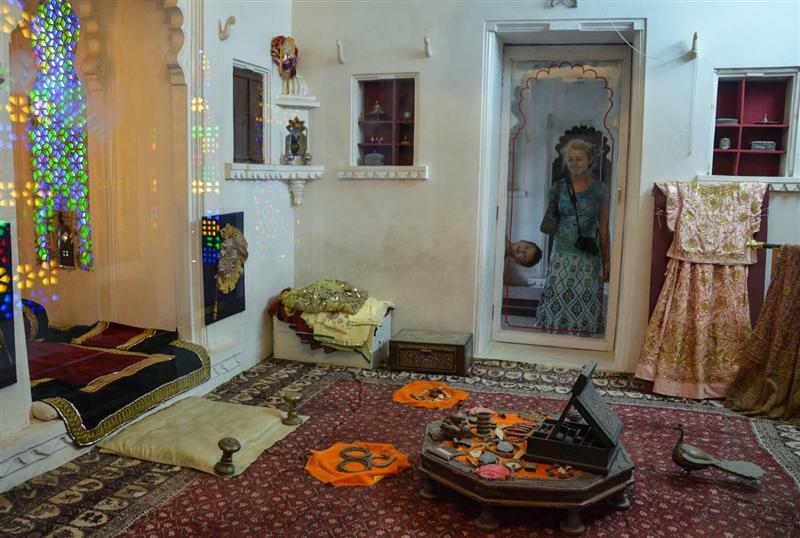 Bagore-Ki-Haveli houses a curious collection of oddities, and is worth visiting to learn about how the royals once lived. 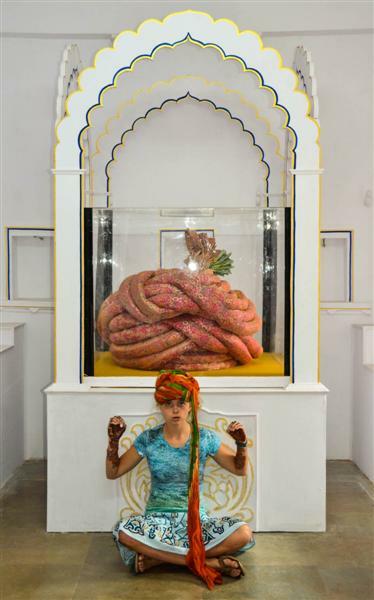 I wouldn’t go too far out of my way to see the world’s biggest turban, but it’s an interesting place to spend an hour if you happen to find yourself in Udaipur. And although we didn’t feel well enough to return for the cultural show, we were told that it’s a must-see. Oddly, I will be in India next week, but unfortunately no where near the World’s Largest Turban. Oh well….I enjoyed the post though. Great pictures. I desperately crave a visit to India. The last time I was in SE Asia, I didn’t have enough time. India is a stunning place full of experiences and day to day happenings that you just can’t find anywhere else! I’ve been lucky enough to have 5 trips to India and loved every one of them ( through sickness and health!) 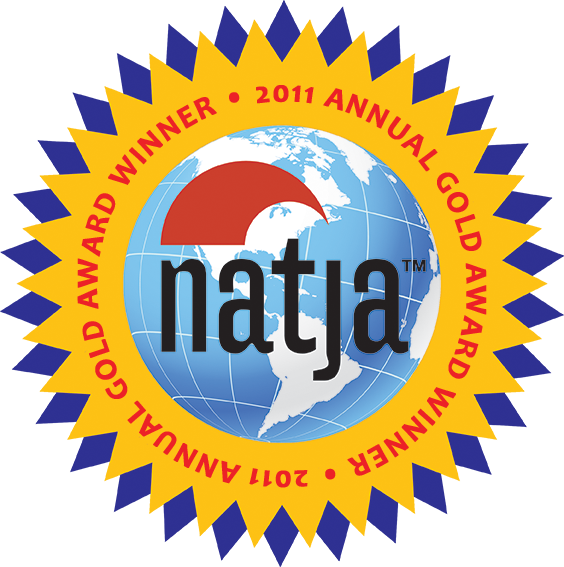 Thoroughly recommend people making a trip at least once in their lifetime…and seeking out the unusual! Amazing photographs, I guess palace authorities should launch a global hunt to find the ‘befitting head’ for this turban. 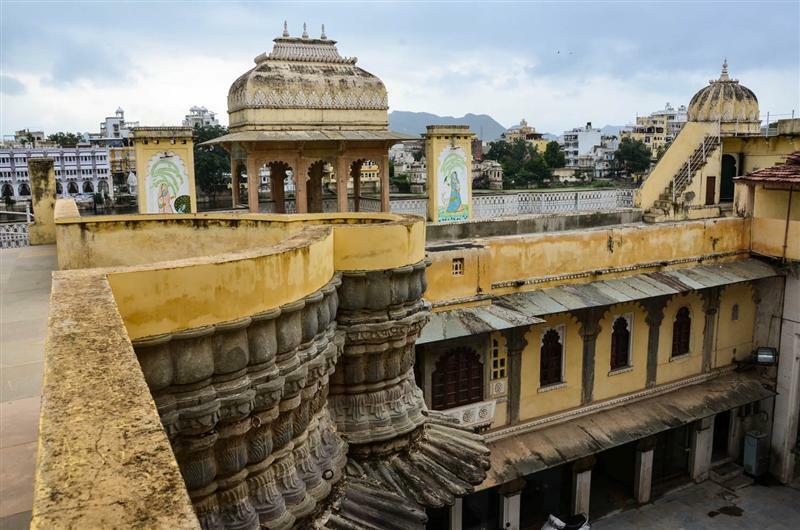 Udaipur is also known as city of lakes, an interesting feature in the desert infested state of Rajasthan.